As the big trend in 2018 was a push for the industry to develop more forgiving, accessible driving irons for the masses, manufacturers also released a lot of great hybrid options to the market this year. I’ll put out a separate best of review for driving irons, but for now, let’s dive into the best hybrids of 2018. Hybrids are designed to replace tough to hit long irons with an easy to launch club that plays like an iron, but has the appearance of a small wood. Manufacturers have spent a lot of time in research and development improving the technology incorporated into hybrids to mirror the technological advancements in drivers and fairways. Those advancements in technology include features like the addition of Jailbreak Bars to the Rogue hybrids, and adjustable loft sleeves and tune-able weight ports and tracks on the Titleist 818 hybrids and TaylorMade M Rescues. The shape of hybrids has always been a contentious issue for many players. Quite often better players will gripe that hybrids appear closed and their tendency is to hook the ball. 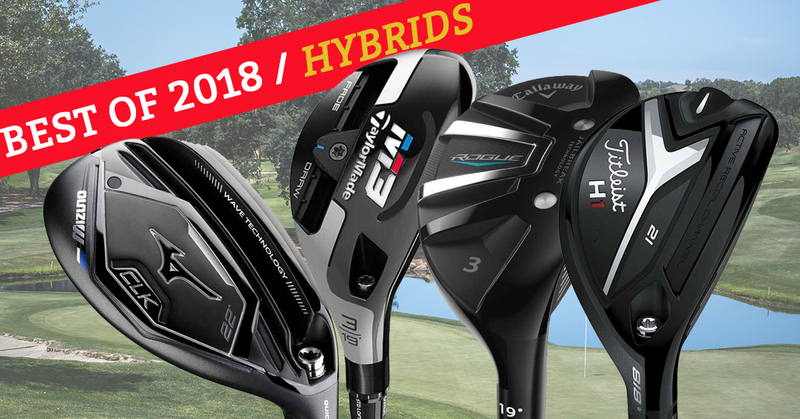 However, 2018 hybrids have great shaping and set up squarely. The ability to adjust weight locations and lie angles also will benefit better players looking for a consistent hybrid option. Right off the bat, I think the best hybrid of the year for players who tend to pull or hook a hybrid is the TaylorMade M3 Rescue. This club has a classic look to it. Some people may have flashbacks of the old Adams hybrids. The feature that makes this hybrid so great for players who pull or hook the ball is the sliding weight track on the sole. Moving the weight all the way out to the toe greatly reduces the chance of a hooked shot. During my testing I used a Mitsubishi Tensei CK Series Blue shaft with the M3 Rescue. As you can see from the chart, the low-spin shaft really produced some longer carry distances and low spin rates compared to the other hybrids I hit side by side. Throughout the multiple hitting sessions with the M3 Rescue, I have been truly blown away by the consistency and distance. The compact look will appeal to better players, but I would recommend anyone in the market for a hybrid give the M3 a test. I love the box toe shape and the look of the compact, two-tone crown at address is incredible. The sound is decent, but the feel is great. I had no issues shaping the ball right or left and enjoyed the smoothness of impact when the ball is struck purely on the sweet spot. Every once in a while, I test a club and even before I hit a shot, I know I’m going to like it. The Mizuno CLK hybrid was one of those clubs. And, based on the performance results it had me thinking about swapping out my MP-18 Fli-Hi 2-iron for a CLK hybrid (perhaps for the winter months?). The classic design is augmented by some technologically advanced features. Similar to the ST180 woods, the CLK hybrid features Wave Technology sole that creates an almost accordion-like spring effect at impact. The Harmonic Impact Technology fine tunes the geometry for elite feel and feedback. The CLK hybrid has a fairly compact club head size and I really like the styling of the dark gray crown. The setup at address is quite square to almost open, and this made it an ease to work the ball right or left. The natural shape was a tight draw, but if I wanted to fade the ball the club would not fight me. The sound and feel are spot on. I tested the Mizuno CLK hybrid paired with a Fujikura Speeder HB shaft, and it produced a higher spin rate than the M3 by about 700 rpm. Mizuno offers no upcharge on all aftermarket shafts, which makes this one of the best values of the year. The ability to pair the proper shaft with a club and do so free of charge is worth its weight in gold. According to the regional Titleist Rep, the most popular hybrids on the PGA Tour are the Titleist 818 H1 and H2 hybrids. The 818 H2 features a more compact shape than the 818 H1, but both offer multiple facets of adjustability. The biggest advancement compared to the 816 hybrids is the replacement of the static weight with the new SureFit weight port. Both 818 hybrids are equipped with the weight port and combined with the SureFit hosel give players the ultimate flexibility to fine tune the club to their swing and setup. I hit the 818 H2 during testing and paired it with the Project X Even Flow Blue shaft. The crown has a similar color to the CLK hybrid and set up squarely at address. I also enjoyed the compact club head, it felt forgiving, but not burdensome or oversize. The Callaway Rogue hybrid received a major improvement over the Epic hybrids, Jailbreak Bars. 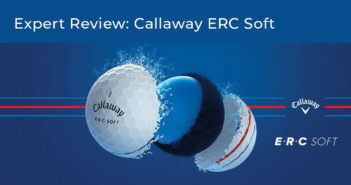 The success of the Jailbreak Bars in the Epic drivers led Callaway to the simple decision to fully integrate Jailbreak technology into all the Rogue woods and hybrids. Visually, the Rogue hybrids are a perfect match to the fairways and drivers, each looking very similar to the other. The Rogue hybrid comes in two versions, standard and the Rogue X. The standard version has a larger footprint than many of the other hybrids on this list, but its size is not a detraction. This is a club that will promote confidence in the player. The Rogue X hybrid is an oversized, supercharged version that produces fairway wood-like distances for players with high swing speeds. Rogue X is great for someone looking to pick up some significant yardage gains along with high forgiveness. I swung the standard Rogue with a lighter-weight Aldila Synergy shaft. The results, especially the increased spin rate and carry distance, are indicative of the softer, higher spinning shaft compared to the shafts I used testing the other hybrids on this list. This is a good hybrid, especially if you’re still a bit inconsistent in terms of ball striking. I enjoy the feel and the sound is inline with the rest of the Rogue woods. Tour Edge designed the CBX lineup without a driver, and instead focused all their energy and development resources on the fairway metal and hybrid. The Tour Edge CBX have made significant waves on the Champions Tour this season, many winners have had at least one CBX club in their bag. The CBX hybrid mirrors and mimics the styling and technologies of the CBX fairway wood. The same combo-brazed face and all-black crown set this hybrid up very nicely. On top of the looks, what I truly enjoy most about the Tour Edge CBX clubs is the sole-turf interaction. The sole has a raised section directly behind the sweet spot followed by a cutout framed by two baffler-like rails. This feature is what makes the club feel smooth through the turf and so easy to keep square through impact. The CBX hybrid is a versatile weapon that can be used off the tee when extra precision is needed and into greens. These hybrids are long and launch high. You’ll have no problem adding a forgivable club like this at the bottom end of your iron set. The stock shaft for the CBX is the Project X HZRDUS Black 85 shaft and it makes for a potent combination.